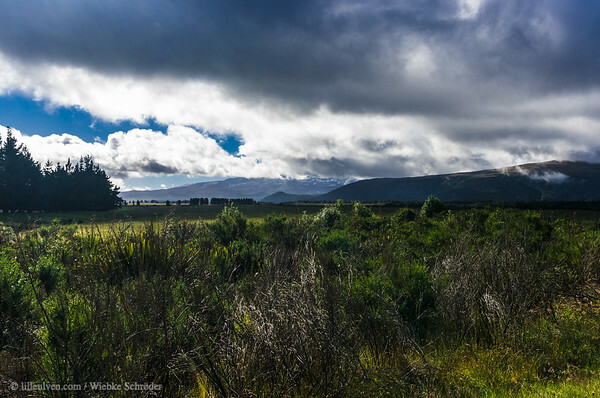 Photos from Lille Ulven’s adventurous bike ride in across the North Island, Te Ika-a-Māui, of New Zealand, the land of the white cloud - Aotearoa - as it is called in the Māori language. For more photos of my New Zealand tour have a look at my photos from the South Island and if you want to read about my experiences in more detail please visit my blog. Some of these photos are also published in my New Zealand calendars which you can find here. National Park Village, Manawatu-Wanganui, New Zealand Tongariro was New Zealand’s first national park. In 1887 the volcanic peaks of Tongariro, Ngāuruhoe, and Ruapehu were gifted to the Crown by Horonuku Te Heuheu, paramount chief of the Ngati Tūwharetoa tribe. More land was added, and the park was established by statute in 1894. By 2007 its total area was 78,618 hectares. It is New Zealand’s most visited national park, and one of the most visible – on a fine day its snow-covered peaks are an arresting sight for people travelling through the central North Island by road, rail or air. The park’s landscapes are diverse. As well as the volcanic mountains, barren lava flows, snowfields and hot springs exist side by side. Volcanoes Tongariro National Park is at the south-western end of the Taupō Volcanic Zone. Its volcanoes are all active, and Mt Ruapehu erupted spectacularly in 1995 and 1996. Ruapehu is the highest of the three mountains, and its 2,797-metre summit has five craters and six main peaks. Its active vent is the site of the Crater Lake, which changes colour according to the volcanic activity below. In March 2007 a lahar (avalanche of volcanic mud and water) flowed from the lake, but it was carefully monitored and caused little damage. Mt Tongariro is the largest of the peaks (100 square kilometres), but the least imposing. Mt Ngāuruhoe, with its steep symmetrical cone, is perhaps the most picturesque. Source: Nancy Swarbrick. 'National parks - Tongariro National Park', Te Ara - the Encyclopedia of New Zealand, updated 29-Jun-15 URL:http://www.TeAra.govt.nz/en/national-parks/page-4 uuid="B70AE7E6-5326-48A5-8735-39F310B5B500" id="New Zealand lilleulven.com 20130118_084949_NZ_Manawatu-Wanganui_National Park Village__www.LilleUlven.com.DNG New Zealand North Lilleulven.com"